Lowering kit for Triumph Legend TT 900. 1 inch lowering links for Triumph TT lowers the rear suspension and the seat height. Excellent accessory for the one who finds the seat height a bit to high or if you just like to give your classic style roadster a lower meaner look. Triumph Legend TT 900 lowering links. 1 inch lowering kit for the Triumph Lengend TT reduces the seat height by lowering the rear suspension. Easy to installation with basic hand tools, installation instructions included. Just replace the standard tie rod connacting arms with the new drop links in this kit. This lowering kit is of very high quality with perfect fit an finish. Powder coated black, with Lust Racing logo. The lowering links are made out of roll forged steel and are stronger than the standard link arms that are replaced. 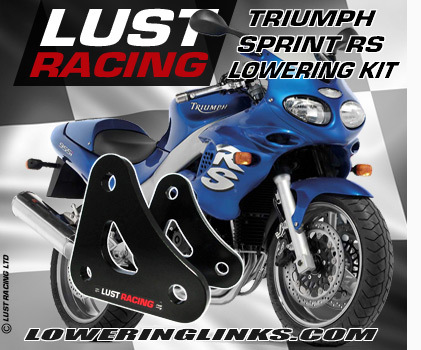 The lowering links for Triumph TT 900 fit all year models 1998 to 2001. *Free shipping offer valid only in combination with purchase, please see out terms of sales. Related products: We have also a 1.6 inch lowering kit for the Legend TT, see other listing in our shop.